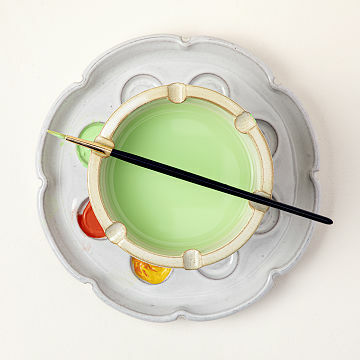 The traditional painter’s palette gets a nature-inspired upgrade in this gift-worthy set. Make the artist in your life feel like they're painting en plein air with this floral-inspired stoneware palette. Including six notches for brush-resting, eight wells for paint-housing, and a bowl for brush-rinsing, this functional yet beautiful gift will coax their creativity to grow and grow. Handmade by Leslie Nieto in Melbourne, Florida. Make the artist in your life feel like they're painting en plein air with this floral-inspired stoneware palette. Including six notches for brush-resting, eight wells for paint-housing, and a bowl for brush-rinsing, this functional yet beautiful gift will coax their creativity to grow and grow. To make and bring to market affordable and high quality clay-based works of art that are innovative, decorative, functional, and have lasting value. The Mud Place LLC pays employees a starting wage of $10.15/hr., which falls within 10% of Brevard County's living wage. The company does not grant employees PTO on a formal basis, but meets all our other criteria for responsible business practices. Stoneware clay is the primary material. All unused clay from trimmings and scraps is recycled by adding water and then wedging and reconditioning the clay for re-use. Moist clay can be infinitely recycled. They have donated time, resources, and money to the Boy Scouts of America for the last five years and serve the scouts of the BSA as pottery merit badge counselors. The packaging is mostly made from recycled and/or recyclable materials. The new boxes, bubble wrap, and peanuts are recyclable. Master cartons are made from 100% recycled materials as well as being fully recyclable. There's one place—and only one place—where you'll find the Petal Palette: UncommonGoods. This was a gift, so I can't. comment on how well it works, but the recipient was very excited to get it. It was a little larger than either of us expected (not a bad thing). My mother-in-law is an artist and I knew this would be a beautiful keepsake that she would use for years to come! This product was so good I did a YouTube video about it! Hello! I actually became instagram friends with the maker of The Mud Place after I posted a YouTube video on my channel (bestinshore) or (just look up my name Jillian Clemmons), b/c I was legitimately so grateful to find this item. I needed something that prevented my brushes from rolling around, held my paint water (and paint) and looked nice on my tiny desk. This clicked all the boxes and is beautiful and well priced. I love that when I'm done painting and need to do office work on my desk, I just pick up my petal palette and move it to another area (though I usually just leave it on my desk b/c it doesn't take up much space. If you'd like to see my unboxing of this product, find it on YouTube! So excited to see her face when she opens and also uses this gift. Perfect! I'd been needing something at my studio table while working on smaller watercolor pieces. It's necessary to sit for these techniques. This palette plate and cup were not only stunning quality and heft, there's not one bit of waste! Exactly what I needed and it found its way to me. Makes me a better watercolorist! I want to buy one for each of my painting pals! It's simple, yet practical. A joy to have by my hand. My friend was delighted with this gift! It fits all my needs! As an artist who primarily works in watercolor, this caught my eye on the website. It will work - but mostly look - so much better than my current plastic palette and water jar.